When I was in high school, my mother had no clue what to get me for Christmas. I wasn’t a difficult teenager, but I was particular, snobby, and preferred high culture above all else. I had severely intense reading habits and watched almost nothing except British dramas and comedies with my father. For some reason, I’m not sure why, my mother bought me a deck of Gypsy Witch Playing cards. Go to Amazon to have a look. They’re quite remarkable and captivating. There are 52, along with two jokers, and each card has a traditional bicycle card face in the upper left corner. In the upper right is a number (which seems to have little relation to the card type) and a few lines of text. At the bottom of the card is an illustration. At first I wanted nothing to do with the cards, but they were purple and pretty and the gypsy witch on the card face appealed to me. I liked that she has a nice figure, looks friendly and approachable, and that she wears a traditional witch hat. I like that she has a cat who waits behind her obediently for a task and I like that she’s brewing something that cannot be dinner. After all, why would she need to be in her full powerful witch uniform if it was merely dinner? Whatever is in that cauldron could force nature to do her bidding. Above all, I liked that she was alone, because I was alone. I was a lonely teenager and I found comfort in seeing a powerful woman at work alone, accompanied by a loving pet. And in my mind she was always successful with whatever she was planning. So I began playing solitaire with them. I didn’t read the tiny instructions that came with the deck, and threw them away. But there was something about the divination abilities of the cards that tempted me to use them. I didn’t so much want to know about the future; I wanted to understand the present. And I wanted to know if the guy I had a crush on also had a crush on me. Nothing more silly than that. At the time, it was one of the only questions about my life I could formulate and it was all important. I found two cards in the deck dedicated to love and would help me most attain my answer. Amor, number 42 and the Queen of Spades: “Someone is looking at you with great love and longing”. And Hand in Hand, number 24 and the King of Hearts. Now 24 has a long text, which is confusing if you don’t actually know how to use the cards correctly. So I took what I needed from the description: “friendship will warm into love”. Then I generated little rituals for picking cards and becoming hopeful and excited when one of the cards showed. Recently I’ve been doing research into magic and methods of divination (I can read palms), and the Gypsy Witch cards came back to me. I think I threw away the pack I had, but I managed to find another again in, the most appropriate place, Las Vegas. And at the Gambler’s General Store. Look at this place. It’s extraordinary. They have a massive selection of playing cards for sale. They have retired decks of cards and dice from casinos in the area. They have poker chips in bulk, bingo machines, and sunglasses for poker players which are specifically designed to protect their eyes from casino lights. They have blackjack, craps, baccarat, and roulette tables retired from casinos. They have the biggest collection of books on every gambling and card playing subject. They have other card games such as canasta, pinochle, bridge, Go Fish, even a clever card version of Eye Spy for kids during road trips. And they have a cafe with an impressive food menu. If you want to open an illegal casino in your basement, this is the place to go. It’s even located off the strip, on the edge of Downtown, in an area that looks appropriately shady. While I was there, a woman in front of me was trying to figure out how many chips and packs of retired cards she could get in bulk. When I got home, I opened up the pack and when I saw the purple Gypsy Witch again I smiled, as if I was visiting an old friend. The first thing I did was read the instructions. And that took me on an interesting historic detour. The instructions are written in the style of prose of the late nineteenth century, with lots of tacked on phrases which create dramatic flourishes and delaying meaning. It’s well done. I learned that these cards are based upon the powerful cards created by Madame Lenormand in the 1700s. Some considered Madame Lenormand to be the greatest fortune teller in the world. At least Napoleon did, for she foretold his rise to extreme power. She wrote hundreds of pages about cartomancy, much of it defending her work from detractors. Madame Lenormand’s cards were based upon the traditional card deck and had added images. She used only 36 cards, but fortune tellers do accept using the entire 52 card deck. 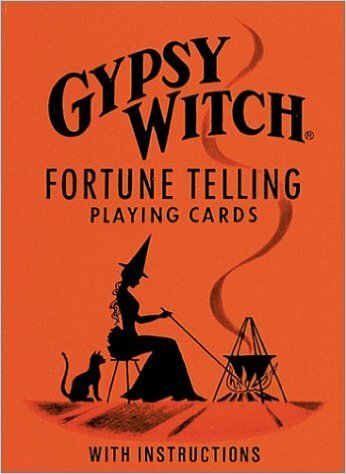 Using the Gypsy Witch cards, the instructions for reading someone’s fortune are quite simple. There is no need to memorize meanings or go into a trance or do algebra. The cards have everything you need. Two cards are removed from the deck, 18 and 19. If a woman is having her fortune told, 18 is placed in the center. If a man, then 19. Cards are then dealt in square formations around the central cards. The positions of the cards determine their importance. Those closest to the central card are most relevant and those furthest away are less so. Then you go around the square reading the cards. It doesn’t matter where you start. Some of the cards are clear on their own (such as Amor) and others dependent on their location to other cards. The entire text of card 24 is “Hand in hand indicates confiding disposition; when in close proximity to 38, 39, 42, or 47, friendship will warm into love. When near 45, favor will be found with superiors, near 48 financial success”. It becomes a little complicated, but never too complex. If anything, it makes it more fun to do a reading because proximity really does change meaning and it becomes more like a puzzle. This could be a fabulous party game. The cards are interesting and versatile in their use, and the fortunes easy to do. In fact, the cards could be used in different variations. For example, when playing Gin, whoever wins can tell their fortune with the hand they lay down. My life is full of joy, gentleness, cheerfulness and gaiety. I will have great financial success, success with financial speculations, and find favor with my superiors. I will have a long and happy life, with domestic happiness. I’m looked at with love and longing (got it!) and will experience a change of residence. Accurate? I recently got married. I’m getting more work online, and plan to form my own dog walking service. And we’re planning to move to the Netherlands. You tell me. 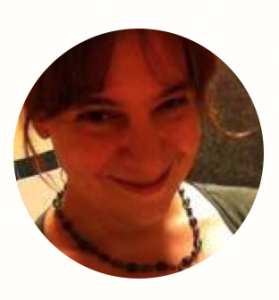 Margie Pignataro is a Fiction/Playwright/Academic Writer from the United Kingdom and a regular contributor to Gifts for Card Players as well as Great Bridge Links.